This summer has gone by in a jiffy! I have no idea how the past few months have whizzed by. I had both my kids at home (from college) and lots of other visitors coming in and out of the house constantly. The result of all this activity was that even though I was cooking for a huge crowd almost every night of the week, I just didn’t have the time to take pictures and write down the recipes. So my blog went on a complete go-slow and now I see that I my numbers have declined so much that I am in mourning. I guess I have to work hard to revive my blog. So now when the summer is winding down, all the kids have left for college. Out of sheer habit I am still cooking in large quantities even though there are just my husband and I at home now. Last night I made a Baked Teriyaki Salmon with jasmine rice and stir fried vegetables and even though my husband and I ate a lot, plenty of salmon was left over. 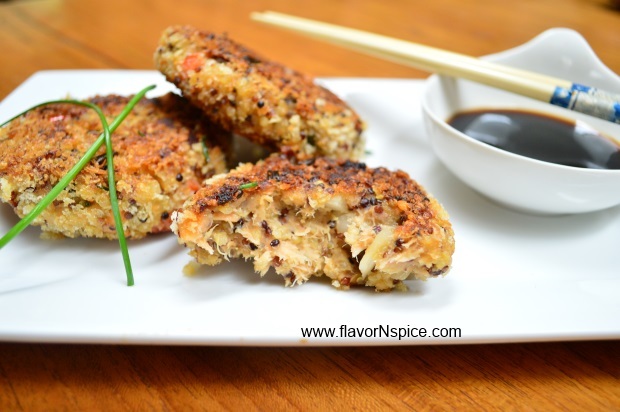 This morning I made Asian flavored Salmon and Quinoa Cakes out of the leftover salmon and they came out really good. 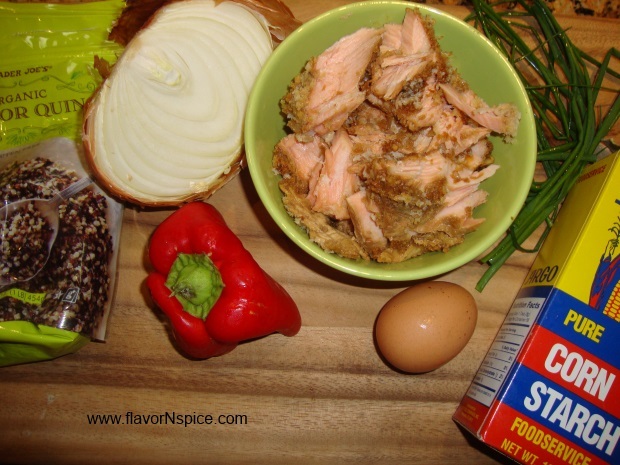 This is a great way to use up left over salmon or if you want to spike up the taste of canned salmon. 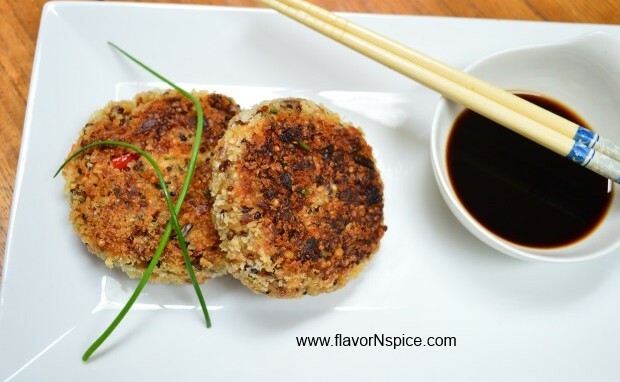 I added soy sauce (as a salt substitute) and lots of fresh ginger to enhance the Asian flavor of the salmon cakes and panko bread crumbs to give the cakes an element of crunch on the outside. The cooked quinoa gave the cake some texture and also volume. I love this dish and this one is going to be a favorite on my repertoire. 1. 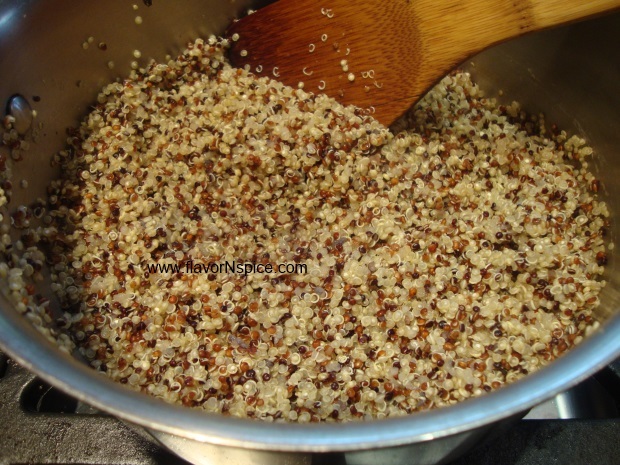 In a medium saucepan add 1.5 cups of water over medium heat and when the water starts to boil, add the uncooked quinoa to the water and let it cook over low to medium heat. 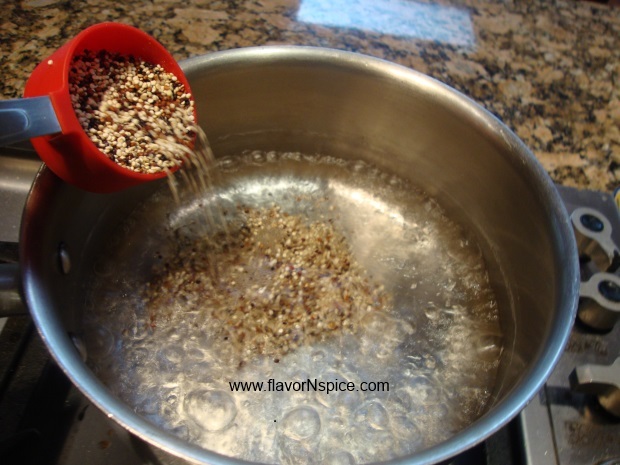 The quinoa takes about 10-12 minutes to cook. 2. 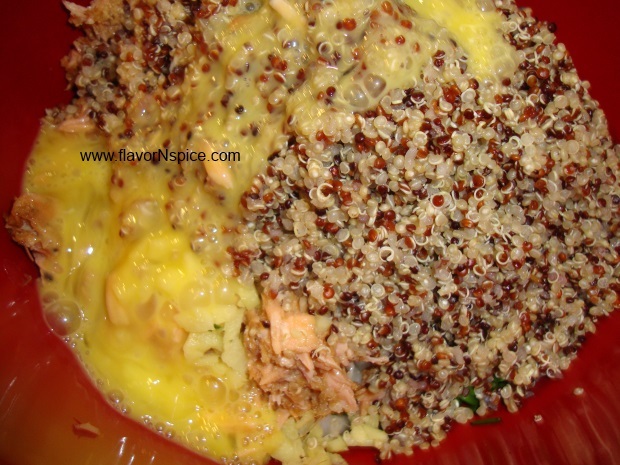 While the Quinoa is cooking, finely peel and dice the onion and place it in a large mixing bowl. 3. 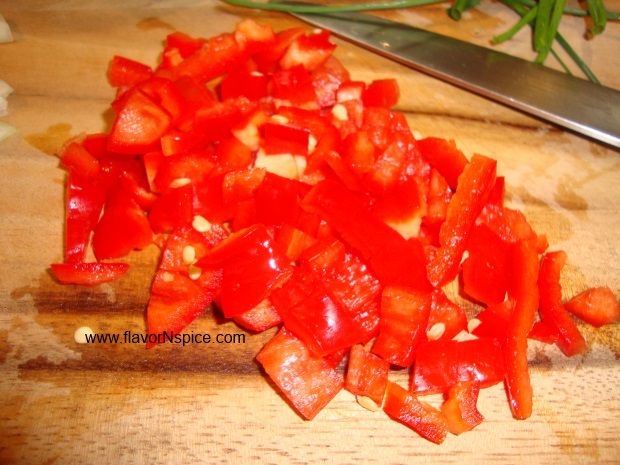 Also dice the red bell pepper and place the diced pieces in the mixing bowl. 4. 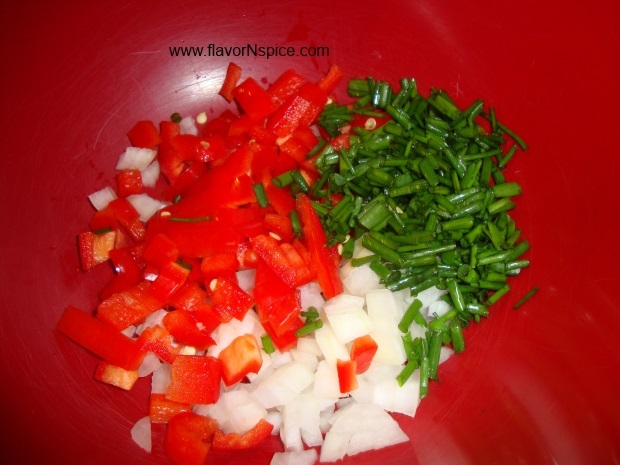 Finely chop the chives and add to the mixing bowl. 5. 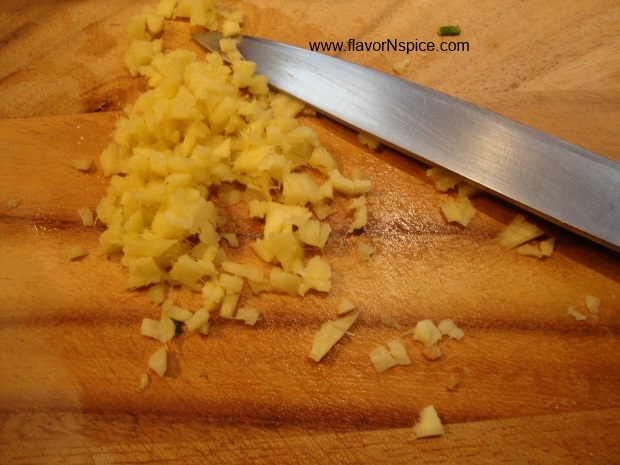 Peel and finely chop the fresh ginger (in as small chunks as you can get them in – a fine dice is good because getting a chunk of ginger in your mouth is certainly not pleasant) and place the chopped ginger in the mixing bowl. 6. 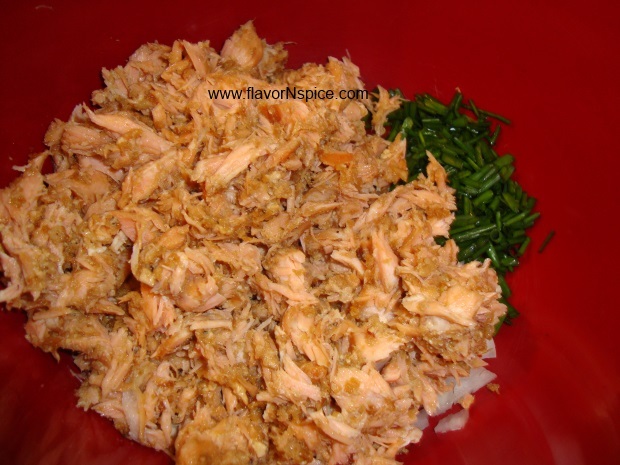 Using a fork shred the cooked salmon and add it to the bowl. 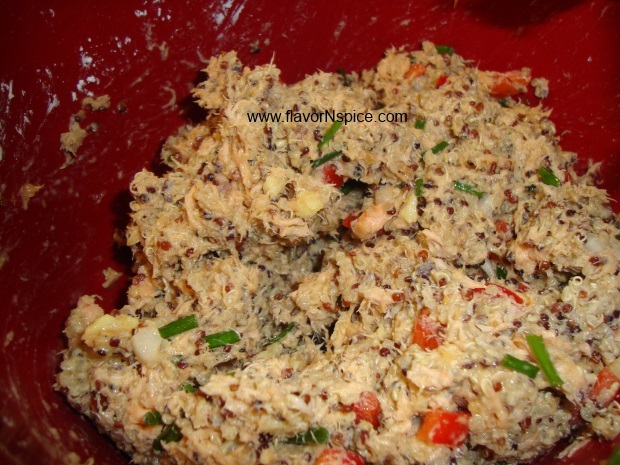 If you are using canned salmon, squeeze all water out of the salmon and then mix the salmon with the rest of the ingredients in the mixing bowl. 7. When the quinoa is cooked (and all the water has been absorbed) fluff up the quinoa with a fork and when it has cooled down, add it to the mixing bowl. 8. Break the egg in a bowl and whisk it to mix the yolk and the egg white and add to the mixing bowl. 9. 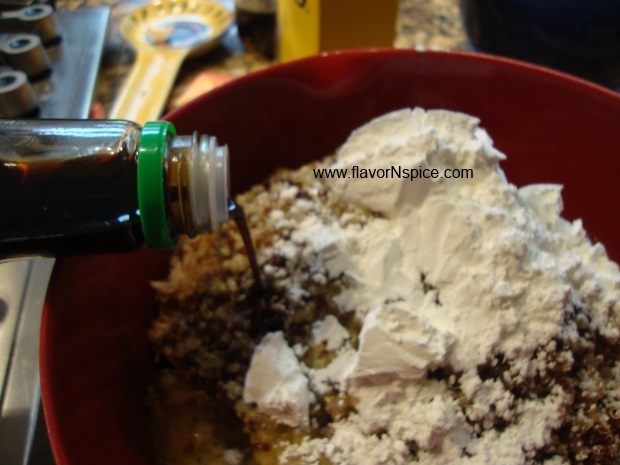 Add the corn starch and soy sauce to the mixing bowl and mix all the contents thoroughly. 10. 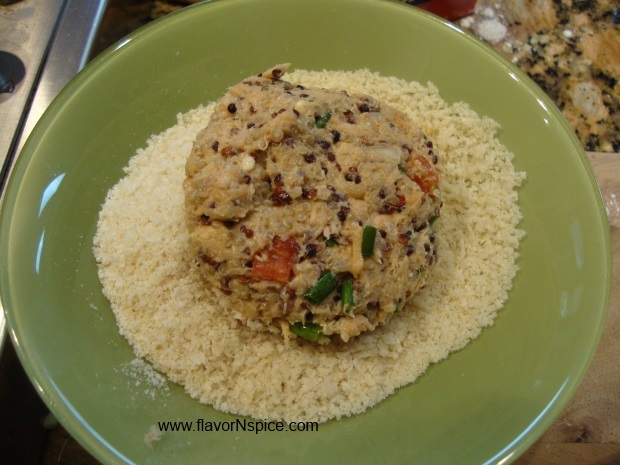 In a large bowl, pour the panko bread crumbs. 11. 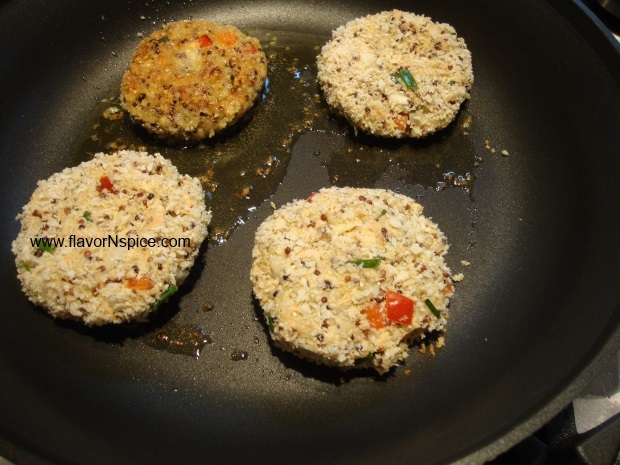 With your hands, make small cakes (hamburger like patties) on the salmon and quinoa mixture and coat each of these cakes with panko crumbs on each side. 12. In a large non-stick pan, add a tablespoon or so of extra virgin olive oil and over low heat cook the salmon cakes on both sides. You will need to cook these cakes in batches. 13. Serve the cakes with a little bit of soy sauce on the side to dip the cakes in. You can serve these (especially if you make small cakes) as appetizers or as an entrée (large sized ones) with rice on the side and some salad or stir-fried vegetables to go with them. Thanks Ally!!!! A compliment from you, the chef-extraordinaire, is huge for me 🙂 yes, I do use canned salmon too – but if I can get good fresh salmon, its always better! I love the Costco wild-caught salmon (the farmed one is good but not as good as the wild-caught) that we get at this time of the year – the best part is that at Costco it is quite reasonably priced too! But of course, I have to buy it in large quantities and the next day no one here wants to eat the leftover fish and so these cakes were a good way to use up left-over salmon. 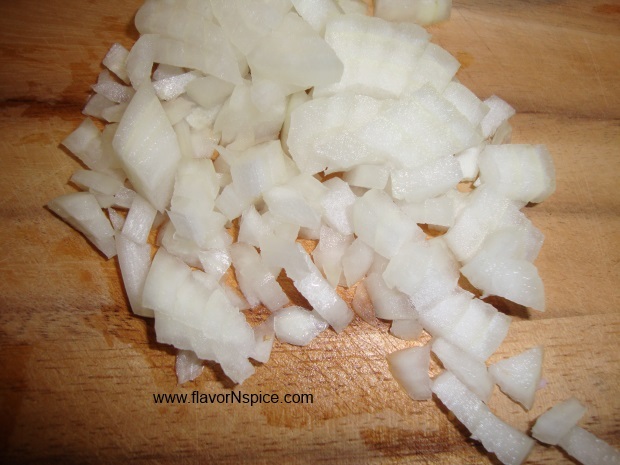 They taste great with the underlying flavor of fresh ginger and soy sauce !!! do try them!!!!! Oh, this looks and promises to taste delicious! I’m planning to give these a try this week. Any recommendations on how long I ought to cook the patties in oil? 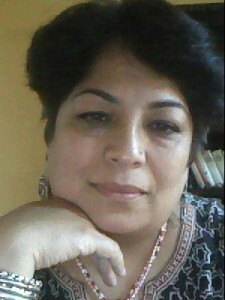 Thanks again for your fabulous blog, didi. What a great way to combine two healthy ingredients. And an awesome weeknight, Friday night dinner – Thanks Shbnam.